Human Resources (HR) designs and delivers people strategies and frameworks to build capacity, capability and culture that meet OneTMR's (see glossary) current and future organisational needs. Planning now for TMR's future workforce capability needs is critical to the department successfully embracing rapid innovation in our industries and meeting customer expectations. As OneTMR we share common purpose, work across boundaries, inspire improvement and make the department a great place to work. Living OneTMR is about embracing diversity, innovation, collaborating together and recognising each other for the contribution we each make for a safe, integrated, reliable and efficient transport system accessible to everyone. Last year, the One HR Leadership Board was formed to play an advisory role to the Strategic HR Board. The board collaborates and steers the HR function for TMR. Representatives from across TMR share business insights and co-design HR strategies and solutions that contribute to delivery of our Strategic Workforce Plan. The board meet monthly, with the Chief HR Officer as chairperson. These priorities will be incorporated into the People Plan 2017–18. At 30 June 2017, there were 7192 full-time equivalent (FTE) (see glossary) employees within the department, representing an increase of 160 on last year's total FTEs. Our workforce composition is complex and includes 80 occupational groups spread across trade, professional, technical and administrative disciplines throughout the state. Our permanent employee retention rate was 95.3 per cent at 30 June 2017, compared with 92.4 in 2015–16 and 93.4 per cent in 2014–15. For the same period, our permanent employee separation rate was 5 per cent turnover compared to 5.5 per cent in 2015–16 and 5.4 per cent in 2014–15. The results* include employee separations that took place under a program of redundancies. *Separation and retention rates are calculated using different formulas. Overall combined rates do not add up to 100 per cent. During the year the department has continued to promote and create awareness of domestic and family violence in Queensland. The department is proud to be recognised as a White Ribbon Workplace, with achievement of accreditation announced in July 2016. This demonstrates our ongoing commitment to promote respectful relationships and gender equality within the workplace along with a culture of zero tolerance of violence. Our Director-General continues his role as the department's champion of the cause and as a leader in the community, he took part in the 2016 Australia's CEO Challenge Race (the Race). As part of this initiative, TMR officers across Queensland hosted various awareness and fundraising events such as family fun days, bake sales, raffles, social and wellness activities and competitions. The collective effort raised more than $15,000 for the charity. In June, the announcement to participate in the Race for the third year running was made at an In Her Shoes: A Domestic and Family Violence Awareness Event at which former TMR employee and domestic and family violence survivor, Ms Simone O'Brien bravely shared her personal story. In continued support for domestic and family violence awareness and prevention, the department participated for the second consecutive year in the Australia's CEO Challenge, Darkness to Daylight Run. The event raised over $3100 with more than 160 officers participating to honour the lives lost from domestic and family violence and those left behind. The department will continue to offer a dedicated policy, resources, training and events to promote a safe, respectful and inclusive workplace culture. Our employer brand communicates what it's like to work at TMR to ensure we continue to attract and retain great people with a strong cultural fit to our organisation. A large internal research piece uncovered TMR's people are here first and foremost to make a difference to the Queensland community. They also reported great teammates, work life balance, flexibility and interesting work as key reasons. To bring these concepts to life we created a series of images and an employer brand video with a cross-section of TMR people describing what drives their journey. Strategic and operational workforce planning is undertaken within TMR. Operational Workforce Planning completed at the branch level focuses on determining workforce requirements for the next 12–18 months. Strategic workforce planning completed at the departmental level covers a five year time horizon. Workforce planning seeks to address internal and external factors and trends. Actions are developed at the departmental, divisional and branch level to ensure TMR has people with the right p capabilities at the right time to support our organisational objectives. Throughout the year, research was undertaken to determine the department's current state and aspirational targets for the future. The TMR Strategic Workforce Plan 2016–2020, launched in January 2017, sets the vision and roadmap for the workforce of the future. The TMR Strategic Workforce Plan 2016–2020, along with all of TMR's people focussed strategies and plans align to our Strategic Plan, Operational Plan and Queensland Public Service Strategies. 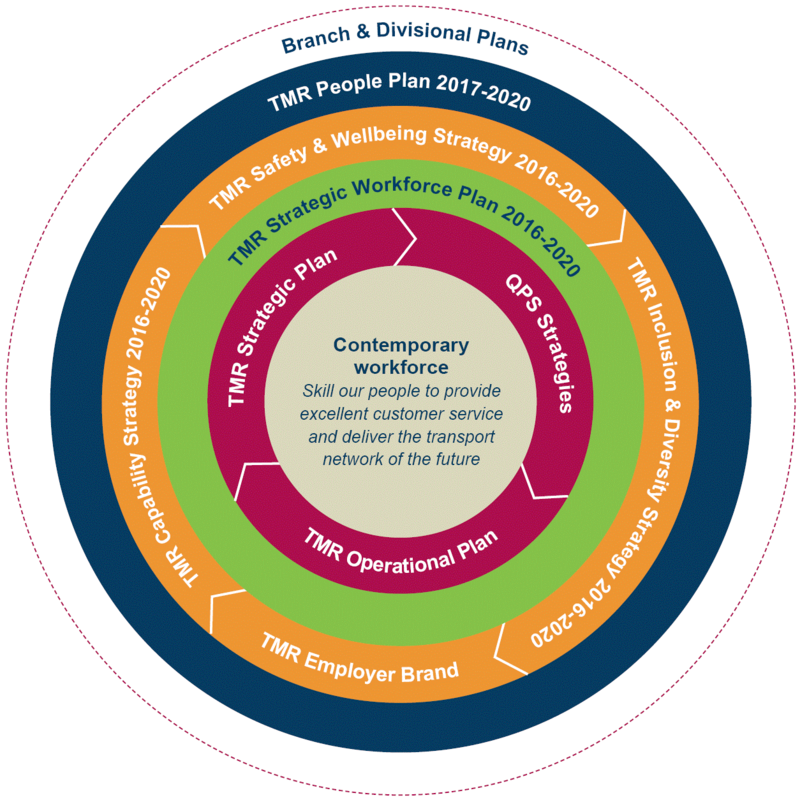 Diagram – outlining TMR's People Strategies and shows how the TMR Strategic Workforce Plan 2016–2020 provides a basis for all of our people strategies. This year, a range of initiatives and projects were delivered via the TMR People Plan 2015–2016. The table below provides a summary of initiatives which were completed. During the development of the TMR Strategic Workforce Plan 2016–2020, the need to review and update the People Plan was recognised. A review of the People Plan was undertaken in consultation with key stakeholders across TMR. The TMR People Plan 2017–2019 and the associated Program of Work is in the final stages of consultation and approval. The new People Plan will be released in August 2017. Intra-agency mobility program Program was piloted and it was determined mobility opportunities will form part of succession planning development in future. Flexible work options An education and promotion initiative was rolled out across TMR. Employer brand An employer brand and employee value proposition was established. The employer brand was released in April 2017 with collateral including a video. Coaching culture A coaching culture map was developed and coaching resources provided on the TMR intranet. SES attraction and retention The Executive Leadership Team approved the use of the Public Service Commission's Leadership Connect program. This program is to provide an opportunity for mobility, a key development step for executives. Enterprise workforce reporting A number of Human Resources forms have been moved to an online platform creating a more streamlined approach to completing tasks such as approving higher duties (see page 119). Enterprise capability plans Piloted a Human Resources Job Shadowing program. The program will complete in July 2017 with an evaluation to take place at this time. TMR continues widespread adoption of Flexible Work Practices supported by the new Industrial Relations Act 2016 – Division 4, Chapter 2, Section 2.7. Our 2016 Working for Queensland Employee Opinion Survey results showed that 71 per cent of our people are happy with their work life balance and 50 per cent report accessing a flexible work option. 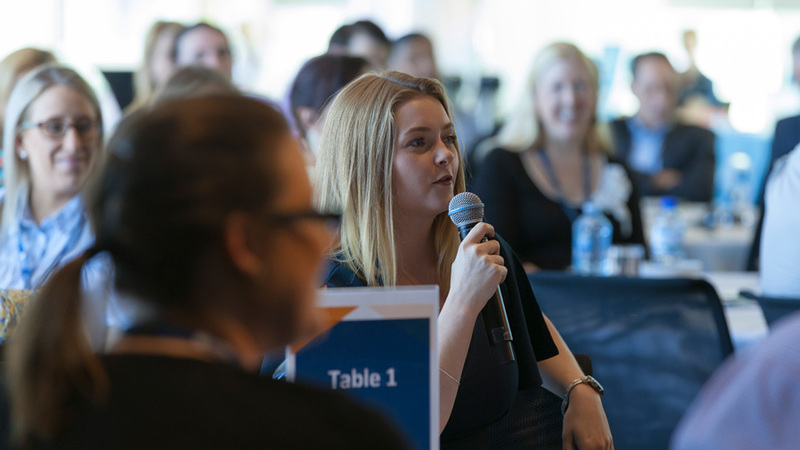 We continue to work with our Flexible Work Practices Action Plan to promote, educate and perform flexible work practices that encourages employees' inclusion, wellbeing and productivity. We invest in capabilities required to serve the current and emerging needs of the government and the department. During the year, we offered a range of corporate programs to support ongoing leadership development. The Leadership Pathway was developed in 2016 to show the required capabilities across all levels of leadership. The Leadership Pathway enables our leaders to understand how they can excel in their current role and progress their careers. Leaders are also required to complete the Executive Capability Assessment and Development (ECAD) or the Leadership Capability Assessment and Development (LCAD) to develop self-awareness and create individually tailored actions plans. Our leadership programs focus on developing agile, dynamic and flexible leaders who can lead in any circumstance. They are available to team leaders, program managers and executives. Our key programs include the Emerging Leaders Program, Public Sector Management Program, and Manager as Coach. Our programs are developed and delivered by trusted external partners and give our leaders the latest knowledge and skills to enable their development. TMR continues to support leadership development not just through formal training, but also through coaching, mentoring and on-the-job learning opportunities such as special projects and relieving in higher roles. 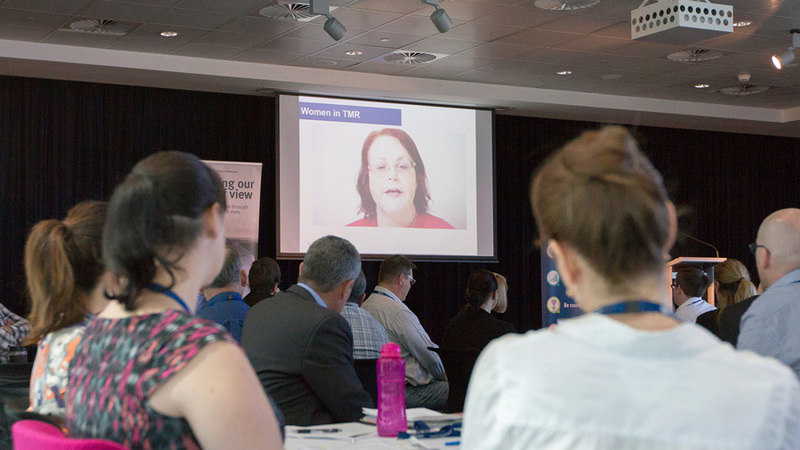 The TMR Induction Program is delivered through five blended learning modules and is designed to create connections between personal and corporate values. 68 per cent of the inductees who provided feedback said the program increased their understanding of TMR's culture and values. No redundancy or retrenchment packages were paid during the period. During 2016–17, the department experienced an increase in complex case management issues and situations requiring management of employee performance, medical conditions and long term absenteeism. This increase can be partly attributed to the reporting requirements under the Public Service Commission's Conduct and Performance Excellence (CaPE) framework which requires proactive management and reporting of conduct and performance issues. There was also an increase in the number of matters deferred to the Queensland Industrial Relations Commission and/or Industrial Magistrates Court, including promotion appeals and fair treatment appeals. The vast majority of these matters have been resolved in the department's favour with no detrimental outcomes. The Executive Leadership Team support the Enterprise Bargaining Agreement process including implementation as a result of certification in the Queensland Industrial Relations Commission for TMR's Transport and Main Roads Enterprise Bargaining Certified Agreement 2016 and the Transport and Main Roads Operational Employees' Certified Agreement 2016. The department continues to engage and work collaboratively with other state government departments, the Public Service Commission and applicable unions now that the Modern Awards have application across the department. There has also been increased engagement with the Greater Leadership Team across TMR while the new Queensland Industrial Relations Act 2016 and its impact on the department is being managed.